Here is the famous Chewbacca. 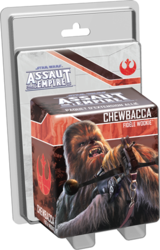 Chewbacca, Faithful Wookie, demonstrates his unwavering loyalty in your Assault on the Empire! Fight alongside him in "Festivities", a side mission that will fit into any campaign. This expansion also contains unmatched Command cards, as well as two unique skirmish missions to play one on one.